Chopsticks talks with members of his cabinet. 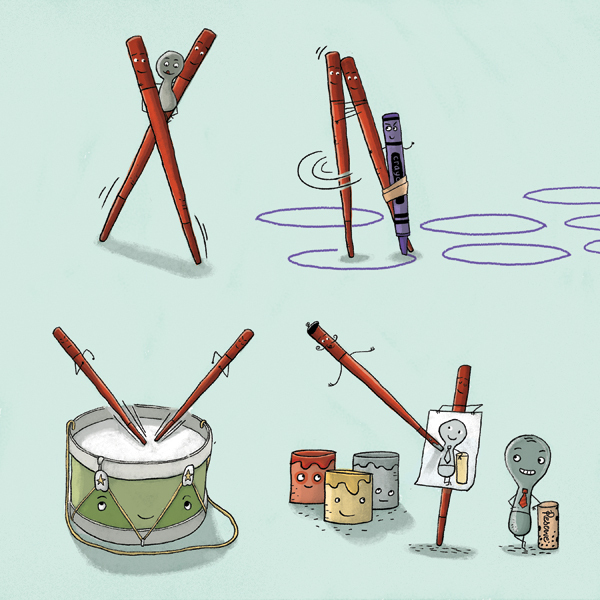 Chopsticks for me was a blast to illustrate. I loved returning to the utensil characters we grew to love in Spoon—but I also liked drawing the simple but striking shapes of chopsticks on a page. This story is a classic-coming-of age tale about working together but also learning how to stand on your own. Written by the brilliant Amy Krouse Rosenthal (Plant a Kiss, Little Pea, Duck Rabbit). Chopsticks is published by Disney Hyperion. The perfect book for twins? Chopsticks is an Indie Bound “Next List” pick for Winter 2012! Spoon and Chopstick's origins revealed in this blog post by author Amy Krouse Rosenthal! Looking for some Chopsticks fun you can print and use at home? Here's a maze and a pairing quiz. Hours of fun! Drink it in February 4, 2020. More soon.